Just when is bespoke, well, bespoke?…..
Just what does bespoke mean? It is a term that our industry is constantly challenged by. To many people it can mean many different things. It can range from the absurd arguments – something being made in the Far East versus in the United Kingdom, to a battle between theorists about the number of hand stitches that go into every garment. Very respected tailors have offered their thoughts before, suggesting the word bespoke comes from the word bespoken (to be-speak your cloth). However, a qualified tailor in China can be just as good as a tailor on Savile Row. And what if the tailor on Savile Row is Chinese? And the tailor in China is British? As strange as it may seem, it happens. Where does the argument about garments being made overseas conclude in those circumstances? Similarly, there are tailors who insist on a minimum of five, six or even seven fittings for every suit they make. But what if the customer doesn’t need it? Surely the process is there to serve the customer, not the tailor. 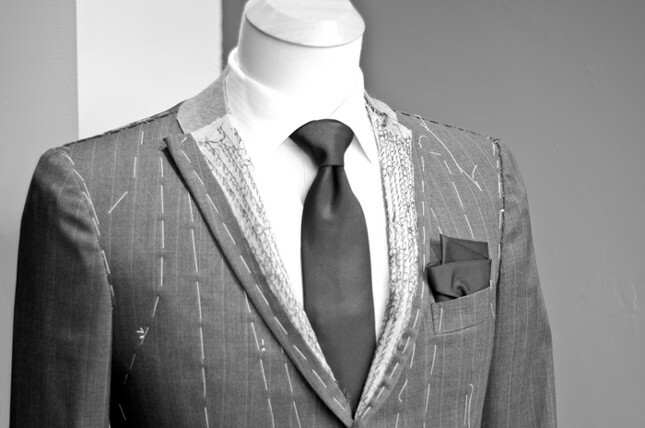 Similarly, what if a tailoring house has only one house style….is that really a bespoke service for the customer? There are some fabulous tailors, but they may only offer one house style cut, albeit in any size and figuration you may wish. But is that truly bespoke? Cutting the cloth and who cuts the cloth is often the crucible of many arguments. And what if a machine cuts the cloth from measurements the cutter has decided? A laser machine cuts much more finely than garments which are hand cut. Hand cutting leaves lots of loose threads and room for many complaints from a customer, but some prefer it. So why not let the customer – with guidance – cut some of his own cloth. Surely a customer cutting his own cloth would be truly bespoke? Additionally, but just as importantly, I firmly believe that a bespoke garment is not just about providing a unique pattern and size to each and every customer. It is about providing a truly bespoke service. Is bespoke when a customer is expected to meet a tailor between 9am-5pm, Monday-Friday and at just one location: the tailor’s shop? Is it a truly bespoke service when a garment is being sent to a customer, that the customer cannot choose the exact hour and even minute they want it delivered? Should a customer not have the mobile telephone number of their tailor, so that when something does go wrong – a split hem or a loose thread – that the tailor can have it fixed in an instant for that all important meeting or cocktail party? A truly bespoke suit or shirt can only so called, I believe, when it is complemented by a truly bespoke service. See also: bespoke, Charlie Baker-, China, customer, Henry Herbert Tailors, laser machine, loose threads, many different things, Savile Row, the Far East, UK, United Kingdom. Bespoke Tailors Providing Bespoke Service - Henry Herbert, Savile Row. A bespoke garment is not just about a tailor providing a unique pattern and size to each customer. As a leading Savile Row tailor, we provide a truly bespoke service with adaptable hours and a personal contact. Bespoke tailors need to fit their clients in both senses of the term!